A rather similar defense was lamellar armor. This probably first appeared in eighth century B.C.E. Assyria, composed of interconnected plaques or hoops, all worn over an undergarment. The Roman legionary's metal lorica segmentata is an example, as is the lacquered leather armor of Japanese samurai. The remarkable terra-cotta tomb figures of emperor Qin Shih Huang (221-210 B.C.E.) demonstrate China's use of lamellar armor for various troops identified by rank via color-coding and tassels. Mycenaean warriors during the Trojan War, and Greek hoplite infantry who fought the Persians wore body armor of layered linen. The Greeks and the inhabitants of the Italian peninsula also made use of bronze cuirasses (torso armor) embossed with musculature. All types were worn over an undergarment resembling period male ensembles. Ancient Asian-style armor with chain mail. Leather and textile armor were used throughout the Middle Ages, and not surprisingly, their form and style conformed to prevailing civilian fashion. The most common metal armor in Europe until the thirteenth century was mail, the name derived from the French maille, or "mesh." Mail shirts, worn over a heavily padded undergarment, or aketon, eventually covered the thighs, and developed long sleeves with mittens. Mail hoods (coifs), leggings, a conical helmet or a barrel-shaped helm that covered all but the eyes, completed the defense. As extra protection against powerful weapons, a long, wooden shield was carried. Such warriors were expensive to maintain, and of great wealth-deriving this from lands given to them in return for military service. These armored men thus became the horse-mounted knights of popular imagination, and in many European languages, the words "knight" and "horseman" are identical. Each warrior was identified by a system of symbolism called heraldry. A knight's "coat of arms" appeared on his shield and, from the twelfth century, on a gownlike surcoat over his mail. The surcoat's length followed civilian fashion; some could actually trip up a warrior in combat. However, better defenses were needed. 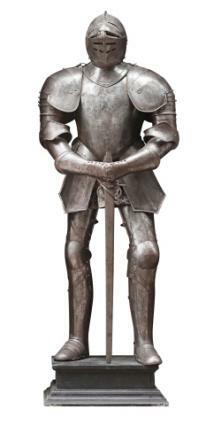 By the early thirteenth century pieces of plate armor reappeared on a scale not seen since Classical Rome and became increasingly common on the torso and legs by mid to late century. Plate appeared in various forms-horn, bone, molded leather-but most often in iron. It offered rigidity and better resistance to weapons. It was shaped to the individual, thick where needed or thin to reduce weight, and its smooth, curving surfaces deflected weapons. It increasingly covered the body, although there seems to have been reluctance by some knights to be encased in rigid metal. Thus, there was a "transition" throughout the fourteenth century to mix mail and plate armor for the knight and his horse. This interim defense remained the primary form of protection in the armies of Islamic cultures and the Indian subcontinent until well into the nineteenth century. By the beginning of the fifteenth century, the transition was complete. 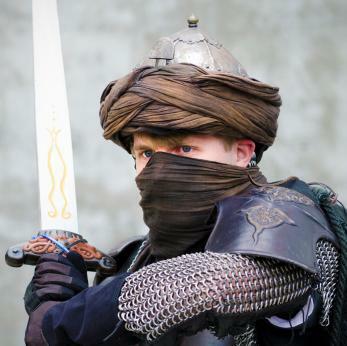 An individual wanting the latest in armor could have full plate-often without the textile covering, and with surfaces polished gleaming bright- virtually head to toe. The status of knights saw their clothing needs increasingly influencing male fashion, and vice versa. The change to all plate gradually produced a wasp-waisted appearance. This slim, hard-body look increasingly mirrored elegant male attire at the end of the century, and each complemented the other. For example, tubular arm defenses required slim sleeves on the undergarment, while shoulders broadened to accommodate extra padding for the load of a cuirass. Some armor elements were fastened to the aketon with laces called points. These also appeared on male apparel, to attach sleeves and hose. The aketon assimilated the new forms and was worn alone as knightly clothing. The surcoat became the short, form-fitting jupon (overgarment). Although most troops ceased wearing armor by the eighteenth century, military engineers (sappers) wore bullet-proof helmets during sieges, and some horsemen wore breastplates and helmets against sword cuts and firearms. The knight's neck defense, or gorget, became a symbol of officer's rank, and many armors became theatrical props. The Napoleonic wars briefly revived the use of some cavalry armor, but by the middle of the nineteenth century, its military use was again largely ceremonial. There were some exceptions, such as the breastplates privately acquired by both sides in the American Civil War (1861-1865), and Australian outlaw Ned Kelly's crude 100-pound body armor worn during a shootout. World Wars I and II revived interest in protective armor on a large scale. Allied and Axis physicians and scientists worked with curators to develop helmets and body defenses for ground troops and "flak jackets" for aircrew, but they used media and technologies little different from those of centuries earlier. Armor developments late in World War II and the Korean Conflict benefited from new plastic polymers. Soldiers' needs in Vietnam led to better armor, but it remained rather heavy and hot. The invention of Kevlar in the 1980s provided a material five times stronger than steel. Produced in fabriclike sheets, then laminated and encased in textiles, this has produced a new range of highly protective and light armor and helmets for the military, sport, law enforcement, and individuals. However, even more remarkable systems are under development in commercial and governmental laboratories, striving to produce another breakthrough technology, one just as dramatic as the suit of knightly plate armor that continues to fascinate us. See also Military Style; Protective Clothing; Techno-Textiles; Military Uniforms.